If you want to get to the bottom of the cheerfulness and gallantry in Mozart’s oeuvre, you can do no better than taking as a contrast one of his compositions that has always been described as gloomy and demonic. Putting aside the often-cited vocal heavyweights such as "Don Giovanni" and Requiem, Mozart’s Piano Concerto No. 20, K. 466 occupies a distinguished position as a resonant counterpart to the charming music he wrote for social occasions in that it takes on a new dimension in his instrumental music. The choice of a minor key, unusual for a concerto, lends a dramatic tone to the composition, whereby the soloist and orchestra engage with one another in sharp contrast. 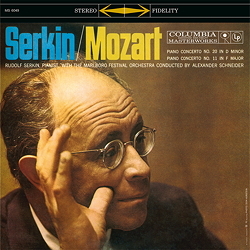 Rudolf Serkin, one of the greatest interpreters of Mozart’s piano works, allows the immense energy of this concerto to slip through his fingers with due care. He battles his way through the weighty first movement with enthusiasm and verve, lets his fingertips dance daintily through the cantilena of the Romance, and then rousingly celebrates the passionate and fiery Finale with a bell-like touch. On the reverse side the Festival Orchestra rounds off this inspiring performance with the filigree and charmingly effervescent Concerto in F major, K. 413 from Mozart’s Viennese period – as cheerful as it is gallant.